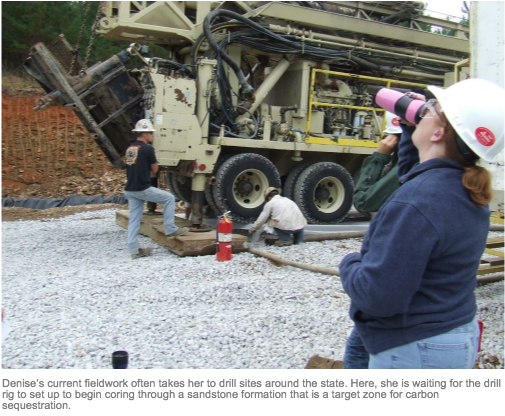 Denise Hills is Director of the Energy Investigations Program at the Geological Survey of Alabama. Denise earned a B.S. in geology from the College of William and Mary, and an M.S. in geology and geophysics from the University of Delaware. She then spent five years in the marine geology and geophysics Ph.D. program at the University of Hawai‘i’s School of Ocean and Earth Science and Technology studying compressional tectonics through marine seismic reflection data. Denise left the program and began work in science education at the Bishop Museum in Hawai‘i and later at McWane Science Center in Alabama. Although Denise enjoyed working in education she wanted to get back into geoscience research, which lead her to the Geological Survey of Alabama, an ESIP Type II member. Denise likes working for a state agency because it provides the best of both academia and industry: basic applied science and cutting-edge research. 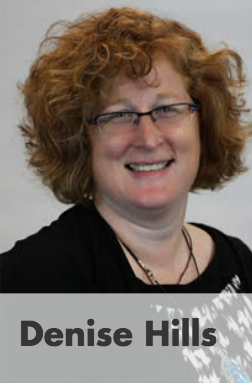 We asked Denise about her research, data challenges and why she participates in ESIP. How would you describe your research? I’ve always been interested in energy research but never wanted the high stakes of working for an oil company. At the Geological Survey, we do basic research on conventional and unconventional energy resources and related topics, including resource assessments, such as natural gas, coal and oil, enhanced recovery processes and carbon sequestration projects, to name a few. We answer questions such as how much oil/gas might be in an area and how much could be recovered? Would a formation be a good target for carbon sequestration and are there good seals in place to prevent carbon dioxide from escaping? What information is available about temperatures at depth, for potential use in enhanced geothermal energy production? Much of our work is done through data mining. We have limited resources to gather new data, so we rely on the huge amount of legacy data available through our agencies and others. What is the significance of your work? As a state agency, the Geological Survey is charged with providing the information necessary for citizens and investors in the state to be able to make prudent, orderly and environmentally responsible decisions for development within the state. We don’t tell people what to do, but rather provide them with accurate, unbiased information so that they can make decisions that are best for their community or business. What are some of the more rewarding parts of what you do? I really enjoy sharing our work with the community and with other stakeholders. It is rewarding when the work I’ve done has an impact on someone–that they better understand our world and resources, so that they can make better decisions. Where in the world has your research taken you? I’ve been all over the U.S. doing fieldwork, although recently most of my work has been in Alabama and neighboring states. I have been lucky enough to do some work overseas too, working on research ships offshore Hawai‘i, Japan, Taiwan and Guam. In the near future, I should be traveling to Alberta, Canada to visit Fort McMurray to learn more about oil sands. What are your biggest data challenges? One of our biggest challenges is overcoming institutional inertia, both internally and on the side of our data providers. Luckily, people on both ends realize things need to change or we will lose irreplaceable information. Developing processes internally that can help our data conform to recognized standards has been another challenge, but one that is being addressed through our involvement with several projects including the National Geothermal Data System (NGDS) and the National Geological and Geophysical Data Preservation Program (NGGDPP). These projects help provide the financial support to justify our time spent on data rescue and preservation. As we rescue and preserve data, we are also making it more accessible, and thus more valuable, to others and are establishing protocols that will make future data management efforts easier. However, our biggest unresolved challenge relates to the handling of our physical samples. We have protocols for some physical items, such as paper records, but even those need better management plans. For example, there was no quality control during initial file scans, so often files are mislabeled or, in some cases, the scan was incomplete. Other physical items provide multi-fold challenges–particularly core samples. First, we have the challenge of capturing the metadata needed to register the sample with an identifier such as an International Geo Sample Number (IGSN). This information can be scattered in multiple files, paper records or in a notebook in someone’s office. How do you determine what information is most accurate and where do you find the time to make those determinations? Second, we have the challenge of determining what exactly gets assigned an IGSN. Does the whole core get an IGSN? Does each chunk of core get an IGSN? Or maybe just particular intervals? What about sub-samples, such as plugs taken for thin-section analysis? Does the hole itself get registered for an IGSN, or for another type of persistent identifier? If another type of persistent identifier, what might that be? Lastly there is the preservation of the physical samples themselves. We are under statutory obligation to keep all samples submitted to the Oil and Gas Board (OGB), but we don’t necessarily have funds for active preservation efforts. It would be a huge loss to the geoscience world if we cannot preserve and protect these data, but finding the time and resources to do so is a hurdle we have yet to get over. Why do you participate in ESIP? When I first came to ESIP, I felt like I had found my people. Not only were these folks interested in geoscience research, they were interested in managing the multitude of data that the geosciences produce! 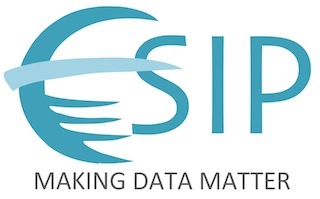 I participate in ESIP because I need to learn how to better make my agencies’ data matter. I’m grateful that our state geologist sees the value of my participation in ESIP and encourages me to continue my involvement. He understands that we as an agency need to learn how to better manage our data, preserving it for present and future use and thus increasing its value, and our agency’s value.